Takikomi Gohan is a traditional Japanese dish of seasoned and mixed rice where all of the ingredients are steamed along with the rice resulting in a dish that is packed full of delicious flavors. Often, Takikomi Gohan is made with fresh seasonal ingredients such as vegetables, mushrooms, or seafood, and this often opens the door for a variety of creative combinations of ingredients. 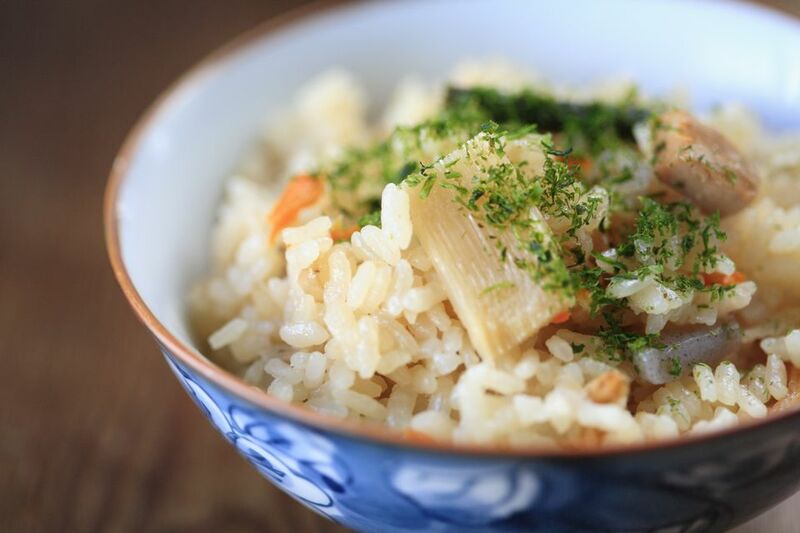 Traditional Takikomi Gohan which is often served in the home at family dinners includes a few standard ingredients including carrots, shiitake, gobo (burdock root), konnyaku (yam cake), and chicken. This five ingredients are considered a very basic combination. The rice is simply seasoned with soy sauce, mirin, sake, and salt. Wash rice and drain in a colander. Set aside for 30 minutes. In a small bowl, take the cubed chicken thigh meat and marinate with 1 teaspoon soy sauce. Peel off the exterior gobo (burdock root) skin with a knife or vegetable peeler and shave into thin strips. Soak gobo strips in a bowl of water for about 5 minutes. Drain the gobo and set aside. Prep vegetables: carrot, konnyaku (yam cake) and shiitake mushrooms. If shiitake mushrooms are dried, reconstitute in water. Remove excess water and slice. Reserve shiitake soaking liquid to use in place of some of the water in the next step #5. Put 2 1/2 cups of water in a pan. If reserved shiitake soaking liquid is available, use this to make up the 2 1/2 cups of water. Add sake, mirin, 2 tablespoons of soy sauce, and salt. Heat the simmering liquid. Add chicken, carrot, gobo, shiitake, and konnyaku to the liquid and simmer for about 5 minutes, skimming off any foam or impurities that rise to the surface. Remove from heat and cool. Separate the simmered ingredients (vegetables, chicken, and konnyaku yam cake) and the liquid, using a colander, but reserve the simmering liquid. Add some water to the simmering liquid to make 2 1/2 cup of liquid total. Put washed rice in rice cooker and pour the liquid over the rice. Lightly stir and place simmered ingredients on the top. Start the rice cooker. When rice is cooked, let the rice steam for about 10 minutes before opening the lid of the rice cooker.